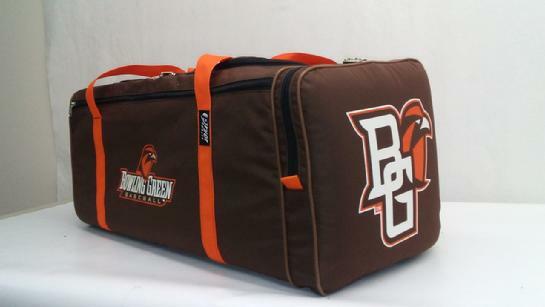 The Ultimate Player Bag is ideal for the high school student.Optional 2 bat sleeve compartments to easily carry your bats. 2 zippered pockets on the outside of the bag and 2 interior pockets. Ends of the bag are padded. Back of the bag has a mesh pocket. Measures 22"x12"x13" with a 3" pocket on one end. Extra vinyl reinforcement along the bottom. $58.00. without bat sleeves, $63.00 for one bat sleeve, $68.00 for two bat sleeves. We also have a smaller version which measures 10"x10"x20" with a 2" pocket on one end. Price starts at $48.00. 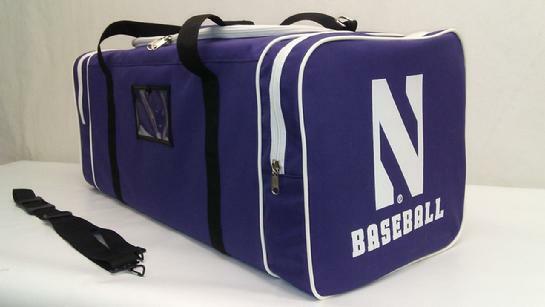 THIS IS A SMALLER DUFFEL. 2 GROMMETS ON BOTH ENDS FOR BREATHABLILITY. U-SHAPED ZIPPERED LID FOR EASY ACCESS. ID WINDOW ON TOP. VELCRO HANDLE. MEASURES 9x10x20. 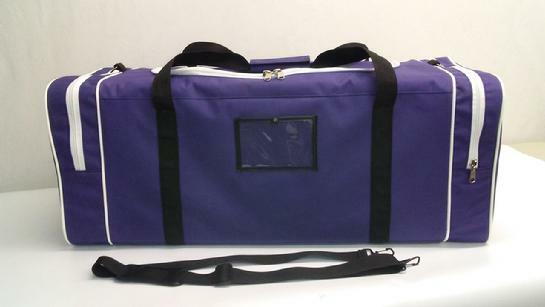 The Pro Travel Bag has padded ends and a vinyl reinforcement along the bottom of the bag. A 2" pocket on one end. Separate zippered pocket along the front and small zippered pocket inside to hold your wallet, keys or cell phone. ID window on back of bag. Total measurement is 14x14x32. 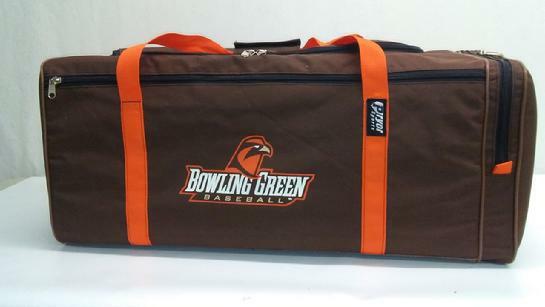 PICTURED BELOW IS OUR LARGE SQUARE DUFFLE. IT MEASURES 14X14X32 INCLUDING THE 3" POCKETS. THIS STYLE IS AVAILABLE IN SMALLER SIZES EITHER WITH OR WITHOUT THE END POCKETS. SEE PRICE LIST ON THIS SITE FOR SIZES AND PRICING. IF YOU WOULD LIKE TO PERSONALLIZE YOUR ITEM(S), MONOGRAMMING IS AVAILABLE - $7.00 FOR INITIALS OR A SINGLE NAME - $15.00 FOR A FULL NAME.